Quickstitchin In Minnesota: Opal Socks finished! 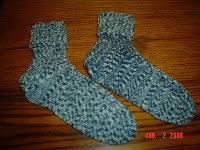 I finished the socks made from the Opal yarn I purchased on line. I love them. Glad I purchased two skeins!